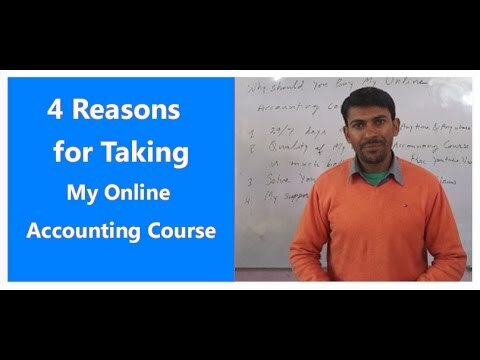 This is online accounting course. So, it will be available for you all time. On your suitable time, you can watch it and study it. It is on you when you study and when you watch and from which part will you start. So, you are totally free with my online accounting course. When I have created it, I did not compromise with its quality because it is not free youtube video or other online free contents. a) Actually, they are also not free. They are free because you have given third party big ads. So, every youtube creator who generate ads income will be more focus on ads earning instead in the quality of free course. Our aim is to direct sell our online course to you. So, we have kept special care about the quality of our creation of this course. b) Second it is not systematic. From this course, you will learn step by step like learning step by step a,b and c and you will reach at z. Whether you are facing financial accounting problem, cost accounting problem, management accounting, corporate accounting problem or accounting software, my this course will solve your all problems. Because from many years of our online work, we are facing such problems many times. So, during the time of creation, we take care of your each problem relating to accounting and provided its solution in this course. You need a personal tutor or guide. Yes, I am available for you to guide. After getting course, you can contact me any time for any further guidance relating to this course. Now, if you want to take my online accounting course, please call me at my mobile no. +91-9356234925 or email vinod@svtuition.org or take online at here.